Way before the Wigwam Village phenomenon swept across the early American Roadside, Frank W. McDonald built this set of teepees in 1928. There had been a filling station serviced by 'native' boys, with small teepees flanking a long low structure housing convenient goods. 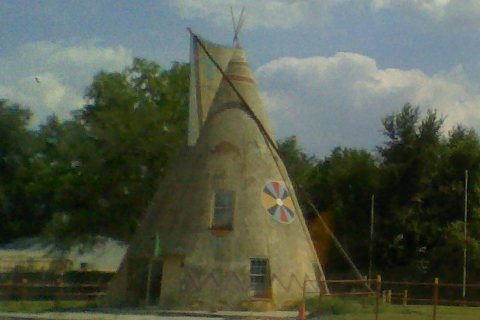 The larger TeePee served as an office for the campground areas. TeePee Junction got a facelift in November 2008, which retined some of the reminders of flood levels past(there are markers painted along the sloping side).